Strengthening our position as leaders in labeling and detection, Enzo Life Sciences now offers Digoxigenin-dUTP and Digoxigenin-UTP, digoxigenin-labeled nucleotides that are suitable for a variety of molecular biology applications. 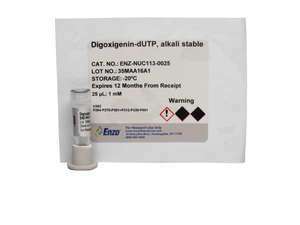 Digoxigenin is a non-radioactive immune-tag, widely used for in situ hybridization (ISH) and protein labeling. It can be paired with anti-digoxigenin antibodies to allow the detection of interested biomolecules with high affinity and specificity. Digoxigenin-based detection overcomes high background or false positives that may arise from endogenous biotin in biological samples when using biotin-based detection. Digoxigenin-dUTP and Digoxigenin-UTP can be used to produce digoxigenin-labeled nucleic acid probes in a variety of labeling reactions. The resulting digoxigenin-labeled probe can be used in a wide range of hybridization applications incuding in situ hybridizations, Southern blots, Northern blots, or dot blots. For more information, or to order the Digoxigenin dUTP, Digoxigenin UTP, or other Enzo Life Sciences products, please visit us at www.enzolifesciences.com or call us at 1-800-942-0430.